WASHINGTON — The Obama administration is blaring the warning signs of America’s impending default, where the American government may not be able to pay its bills. Reuters reports that the new timetable is mid-October, as Obama’s Treasury Secretary Jack Lew announced this past weekend. 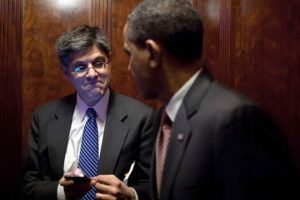 Lew warned that “Congress should act as soon as possible to protect America’s good credit”. The U.S. government is facing a $16.7 trillion debt limit and has only ballooned under President Barack Obama, despite his promises to trim it down. It also does not help that the House GOP had “kicked the can down the road” and extended the debt ceiling this past January, in addition to biased liberal news media coverage of the issue and siding with Obama. Barack Obama has made a ruckus over the sequester, which was his idea to begin with as a part of the supercommittee negotiations in his first term as president. Now, his administration is warning Americans that the U.S. government could default on its payments, which would be a first. This also comes at a time where Obama’s government has sued the credit ratings agency Standard and Poors for downgrading America’s credit rating, which is a result of outlandish and runaway government spending by Congress over the years.